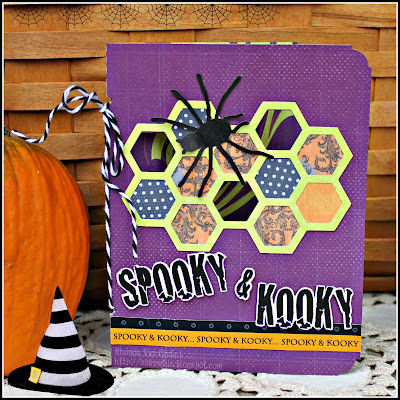 Blog Quick Quotes: Spooky and Kooky! Happy Tuesday to you! Rhonda here today to host the blog for you. The weather is cooling off and the trees are changing colors here in Minnesota. It certainly feels like Halloween is just around the corner! I decided for my project this week that I would work a little with our new Halloween line. This fun hex and negative space card is a Silhouette cutting file. I used the titlework from our Halloween 500 sheet in the collection and the sweet little cardstock spider too. 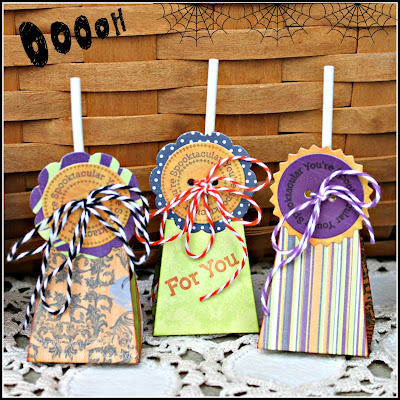 Here are some lollipop treats. Aren't they fun?!! I am going to make these for the kids in my sons preschool room. They contain Tootsie Pop suckers. Thanks so much for stopping on over today! Are you inspired by the season changes or weather too? these are too cute!!! love them! These Halloween projects are too fun!! I am sure your son's class is going to love the treats!! I LOVE the hexagons on the card! Very cool! Like the Halloween projects. Especially like the use of what I call the honeycomb shape.